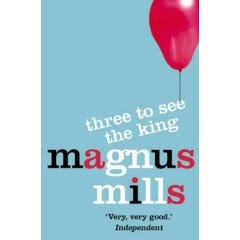 Perhaps you are familiar with the high weirdness of Magnus Mills' rather repetitive, hypnotic style of writing. If you are not, you could be forgiven for thinking, like Mister Monkey, that his books are boring. If you like him, though, you admire his ability to create whole worlds of the type you're more used to seeing in the animated films of the National Film Board of Canada. In this book, a man lives on a windy plain in the middle of nowhere, in a house made entirely of tin. Things happen to him and around him that upset his world where he shovels the sand away from his house every morning. As usual, I hesitate to give much more away than that. This book doesn't have the same tension that some of his previous works do, because at no point is the man who lives in a house made entirely of tin doing anything he shouldn't be doing, and so at no point are you afraid he's going to get caught. Nevertheless, there is still plenty of incident and that Pinteresque sense that a lot is being said in a very short space of time. I like Mills, the feeling that his books are free-floating analogies, directly symbolic of something, but it's something in a parallel universe and you'll never know what. Explorers of the New Century (?) was weak though. Really? That's a shame, I have a nice hardback copy of it and I was really looking forward to it.